“Some people say I only won it because I’m brown”. Suman Kaur, winner of the BBC’s Big Painting Challenge last year, is speaking to me over a cup of Earl Grey in the Tiled Hall at Leeds Art Gallery. She’s angry, and there’s a passion in her eyes as she talks of casual stereotyping, and a lack of opportunities for black and minority ethnic artists to have their work displayed, or considered for exhibition, on equal terms. It’s a Monday, so the shutters at the gallery are down. 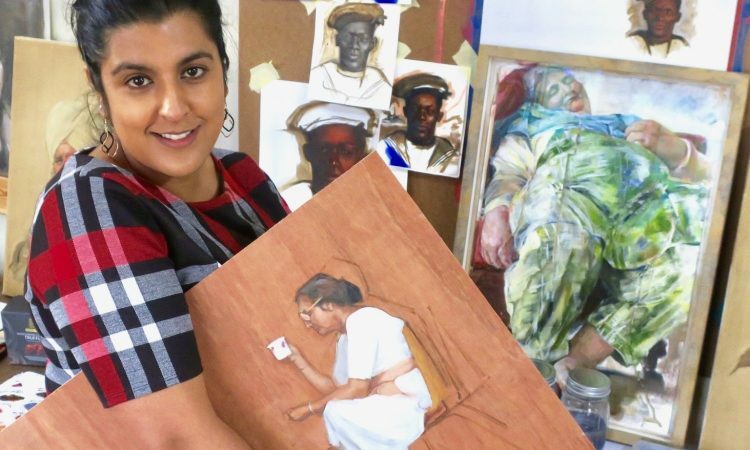 For Suman, it could almost be a visual metaphor for the UK’s arts establishment .. no way in for an Asian woman from Leeds, the only daughter in a Sikh family, who showed precocious talent for drawing as a young child. Not that Leeds, like her family, hasn’t supported her in a big way. 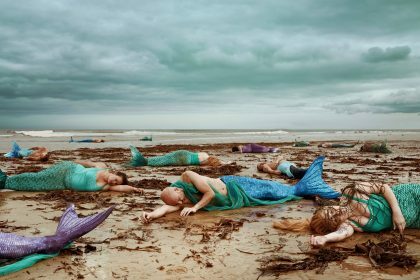 She studied at the Art College, now Leeds Arts University, and was commissioned this year to create an installation at Kirkstall Abbey. Faith in Peace and War commemorates the contributions of Leeds people from different religious and ethnic communities whose lives were lost, or changed forever, by the first world war. Their near-life size portraits are standing in the nave of the abbey this month to mark the centenary of the armistice. It’s a big theme, and one that provoked a reaction on Twitter when Suman posted the comment. In our tearoom chat I asked her to outline the problem as she sees it … and the possible solutions. 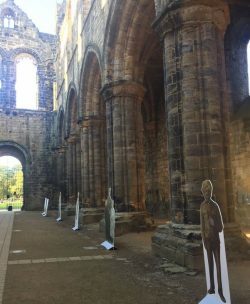 Suman Kaur’s Faith in Peace and War installation is at Kirkstall Abbey until November 25th.